Rick escapes from the tank aided by Glenn, the voice he had heard over the radio. Rick and Glenn meet up with Glenn's friends, a scavenging team of survivors that is part of the same larger group that includes Lori, Carl, and Shane. Glenn's friends inform him that Rick's shooting spree has brought their hideout in a department store to the attention of the walkers. Emotions run high in the group, particularly between a black man, T-Dog, and an unhinged racist, Merle Dixon, which leads Rick to handcuff Merle to a pipe on the store roof. 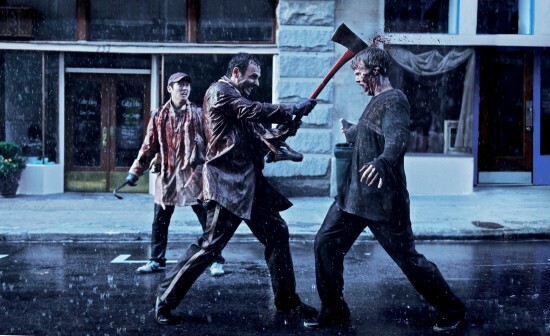 As the walkers attempt to break into the previously safe store, brief radio contact is made with Shane and Lori's group who, unaware of Rick's presence, decide they are unable to help. Rick and Glenn hatch an escape plan and execute it by covering themselves in a "terminated" walker's blood and guts, and making their way to a box truck. Glenn draws the walkers' attention away from the store by racing around in a stolen Dodge Challenger and sounding its alarm. The group escapes the city, along with Glenn, leaving Merle chained to the pipe on the roof after T-Dog trips over a bag of tools and accidentally drops the handcuff key down a drain.